Altar linens and albs are laundered by ladies of the parish. A schedule is published and ladies rotate washing the items, usually having a turn once or twice a month. Cleaning is done on Friday mornings after the 8:30 a.m. Mass where sacred vessels are washed and dried, candles are replaced as needed, furniture is dusted, and the candelabra is cleaned of dripped wax. Both men and women participate in the cleaning. This ministry is such a privilege. As an altar server, one gets to lead the procession into God's House while lifting and holding the Cross high before all, An altar server gets to assist the priests, making the priests's job so much easier and holy. Training is on Wednesdays at 7:30 p.m. in the church. 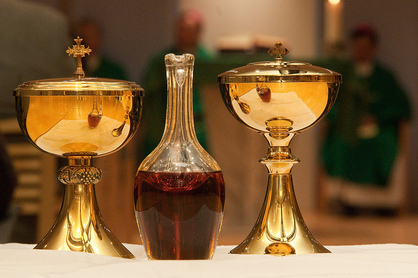 Extraordinary Ministers of Communion are a group of lay men and women who are trained to assist the ordinary minister of communion (the priest) in distributing the Eucharist at Mass or to the ill and shut-ins. Training takes place once to twice a year after which they are certified, commissioned, and then scheduled on a regular basis. Any confirmed and practicing Catholic may apply at the church office. After the funeral Mass is celebrated, a full meal is served to the families and friends of the deceased. The Funeral Reception Ministry is responsible for the planning, coordinating and serving of this meal. The food is donated by fellow parishioners, so there is no expense to the family. The ministry of Lector (Lay Reader) invites and prepares those who feel called to proclaim the Word of God in our liturgies. Information and reflective gatherings are held for those discerning a call to the ministry. ​A call to the office will connect those interested in the Lector Ministry with the Coordinator. All lectors gather annually for continuing lector formation. Mass Captains arrive at the church 20 minutes early to prepare for the next Mass. These duties include preparing the credence table, offertory gifts, liturgical books, candles and more.